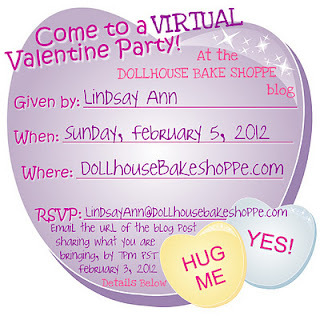 Thanks to the Decorated Cookie I found out about the party, headed over to Dollhouse Bake Shoppe and LOVED her sight! So of course I had to bring some of my famous homemade peanut butter chocolates. You can use any brands. I just happen to have these. Mix all 3 ingredients together, kneading well. I do this with a spatula. Melt the chocolate wafers in a double boiler. Keep on low heat. You could melt the wafers in the microwave too but I'm a double boiler kinda gal. Brush chocolate around the sides and bottom of the mold. I then tamp the mold on the counter to get out air bubbles. Put in the refrigerator until firm. Remove from the refrigerator and fill with peanut butter. Cover the peanut butter with chocolate and refrigerate again until firm. Yummy homemade peanut butter chocolates that taste WAY better than Reeses Peanut Butter Cups. These melt in your mouth. I say they're famous because my friends look forward to them every time I make them. My aunt passed this recipe on to me. She took a class at Michael's and got the recipe there. WELCOME!!! Thank you. These little kisses are so easy to make. Congratulations on your second cookbook. Thanks for adding me to your blog roll. I'm popping over to check out your blog. So cute! I just won some chocolate and lip molds so I will make these!